White ground border Aksu Kap, Tekke or Saryk or ? Here a rather unusual white ground border Aksu Kap. I am uncertain of which tribe it should be attributed to, so I am very interested in hearing your opinion. I suppose Tekke or Saryk is what seems most plausible? The size is 28 x 38 cm, and the knot count I get to ca 300 kpsi. The white to me looks like cotton, and there are highlights of purple silk in the centers on the mainfield. It is the extensive use of cotton and silk which make me think Saryk as a possibility. 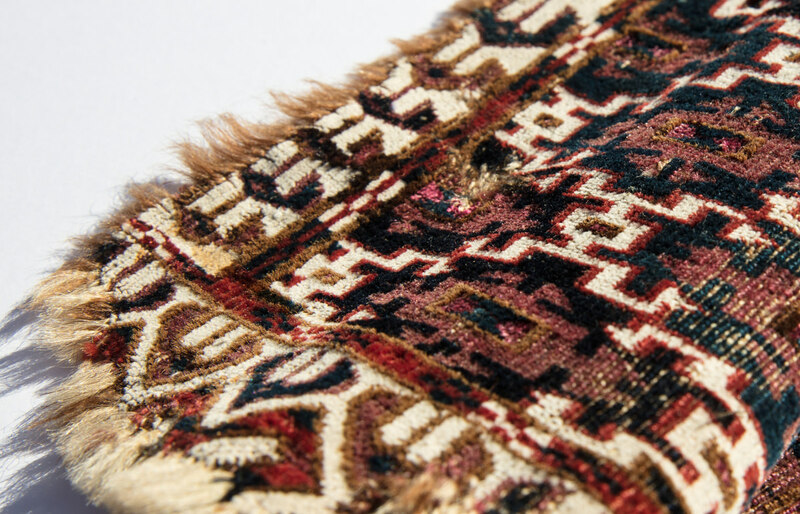 It feels like it is woven asymmetric open right, so I tend to think of it as Tekke. 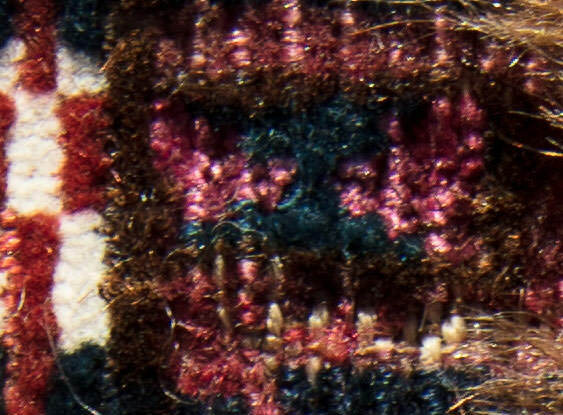 In the top right corners there are remains of an upper guard border, so even though of course the borders are fragmented, the main field is kind of complete. A rather unusual square format? But I suppose the piece is too small for being half a Khorjin? In the main border there seems to be some offset knotting going on. Any comments or comparable pieces much appreciated, I haven't really found anything in my books. And even though it is a fragmented piece in a slightly battered state I enjoy it daily on the wall for its aesthetics. 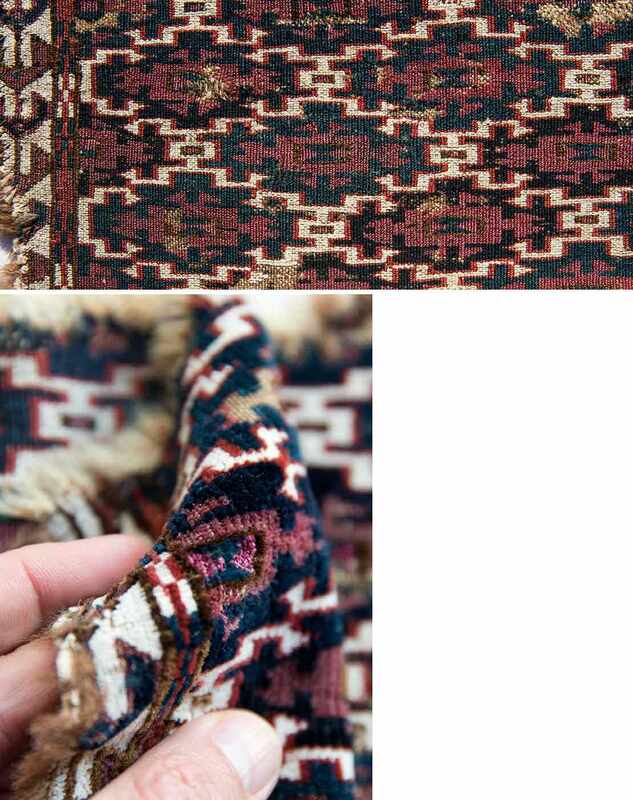 And of course the refined Aksu pattern in itself is interesting. Last edited by Martin Andersen; November 5th, 2017 at 07:38 PM. Reason: corrected from 250 to 300 kpsi. Actually the Elem, or the lower part of the border, with the large ramshorn design could be seen as being in accordance with a generel design layout on Turkmen Khorjins. And I suppose Turkmen saddlebags tend to be rather small. So in conjunction with the Elem and the squarish format I right now tend to think Khorjin instead of Kap. 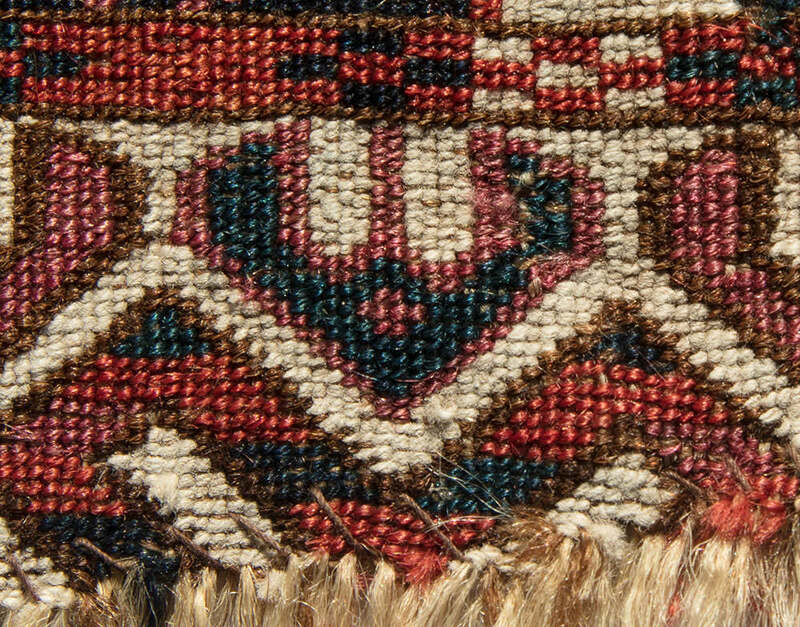 A conversation with Peter Poullada from a few months ago yielded some reference to Saryk work from the middle Amu Darya that had asymmetric knots. But they are open left, not right. Most other Saryk work is symmetrical. The border design leaves an open question in my mind about Yomud work. Tsareva shows several examples of this border from the Ogurjali in the region between the Caspian and (what is left of) the Aral Sea. The Yomud are known to weave open right as well as symmetrical knots. Given the cotton content, I think that it's a reasonable thing to consider. Must admit I haven’t really thought Yomud a possibility, in hand the piece is very fine luxury cloth like, and I dont really associate silke and cotton with Yomud, the color scheme seems too “restraint´ (or refined, sorry Yomuds ) and ain't the 250 kpsi on the high end for Yomud? But I sure might be wrong. Do you have any Yomud pieces with silk and cotton you could post? If it's From Tsareva´s The Hoffmeister Collection or The Russian Collection I can look them up. I admit that I have become hung up on the border and in particular, the execution of the motif. Structurally, Tekke makes the most sense, as previously noted. Whatever it is, functionally or tribally, it has an interesting list of features. 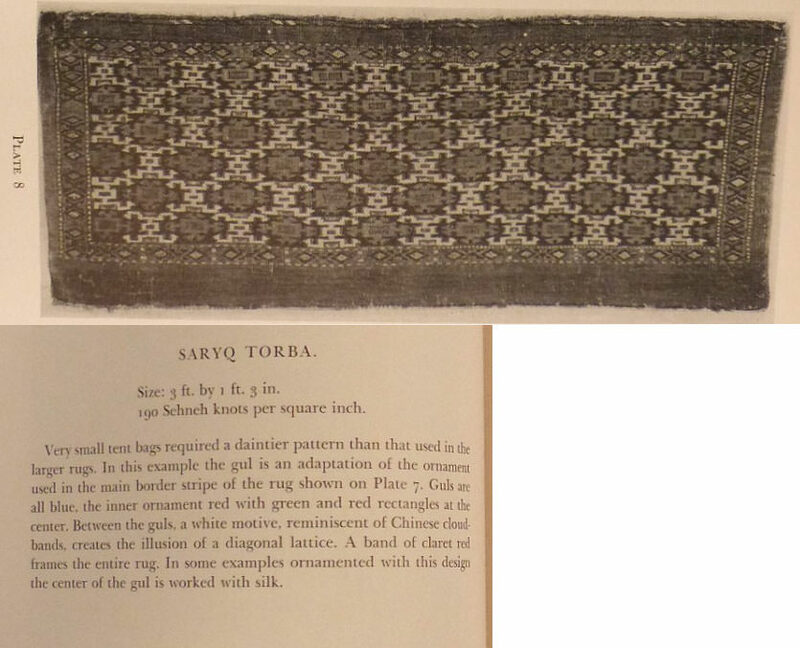 Amos Bateman Thacher illustrates (in black and white) a torba in this design in his book, Turkoman Rugs (1940, Plate 8) which he attributes confidently to the Saryk (Saryq). He mentions 190 kpsi, asymmetrical. He does not provide the orientation of the knot. 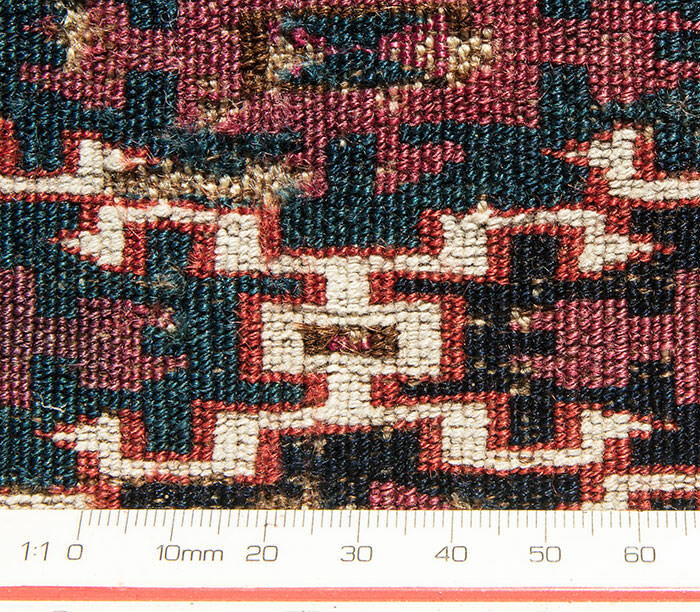 He also mentions that the design often appears with silk in the centers of the 'guls.' Thacher was an original Hajji Baba clubber. Rugs from that group have been published frequently, and it would be interesting to know whether his Plate 8 appears anywhere with more thorough technical analysis. Regarding your piece, I am inclined to go with the Saryk attribution based on the combination of features and palette. I agree the 250 kpsi is getting up there for Saryk work, but it isn't unheard of; and I would have no trouble accepting the proposition that the weaver considered it something of a special piece. 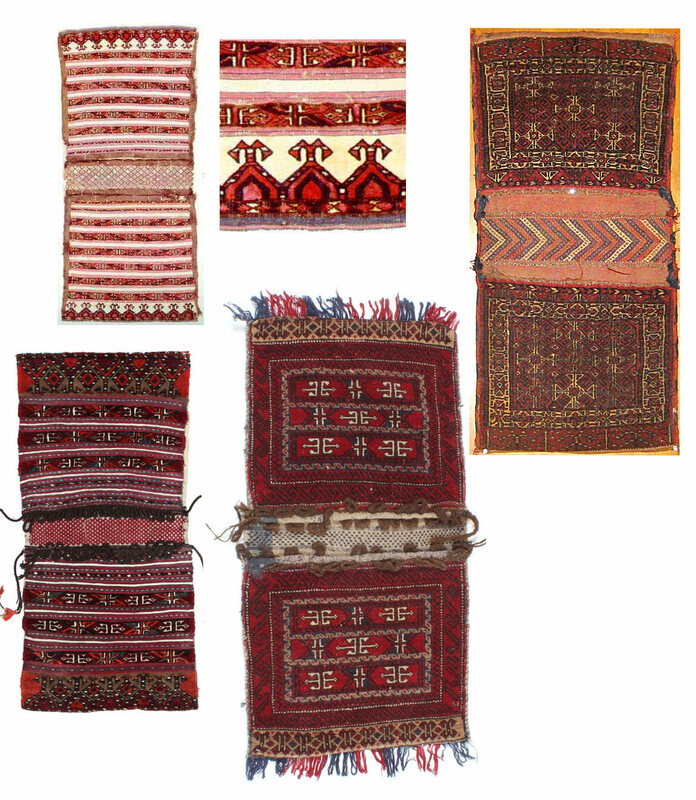 In addition, there does not seem to be any warp depression, another common feature of Saryk weaving. Still, Saryk for me. Doing a little more research, I am unable to find any well documented examples of Saryk work with open right knots. The better published structural analyses are those of Elena Tsareva, and all Saryk examples are symmetrical or open left. 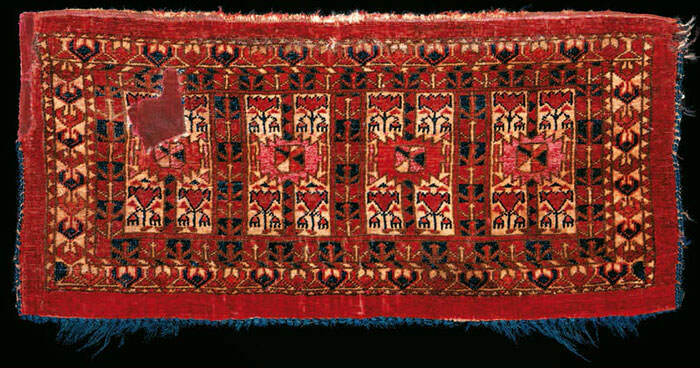 In her book on the Neville Kingston collection, there is an ak-su mafrash shown in the catalog with open right knots, which she attributes to the northern oasis of the Middle Amu Darya. She states that by design it could easily be classed as Tekke but the colors clearly place it in MAD. There is no cotton or silk in that piece. So I still like Tekke (the colors on Martin's piece are inconsistent with Tsareva's MAD piece) , and am still wondering about the border, which does no appear on any Saryk pieces I have found. Sorry I have made a stupid miscalculation in the conversion from cm to inch, the Kpsi is around 300, and not 250. Rich, I suppose a Kpsi this high plus the open right makes Tekke more likely? I certainly still have my doubts, the squarish format and the white Syrga border seems unique in combination with the Aksu design. And the mainfields use of purple (cochenille?) instead of red plus the cotton sure ain´t very Tekke-like. I have another Aksu Mafrash, clearly Tekke, and when looking at the two together they sure seem worlds part. Is there any chance you have a scan of Tsareva's Mafrash from Neville Kingston collection? It is symmetric. I suppose any open right normally automatic would mean Tekke instead of Saryk in pieces without design specifics to say otherwise, except in perhaps very late pieces where Tekke and Saryk tends to totally converge? Last edited by Martin Andersen; November 6th, 2017 at 11:47 AM. 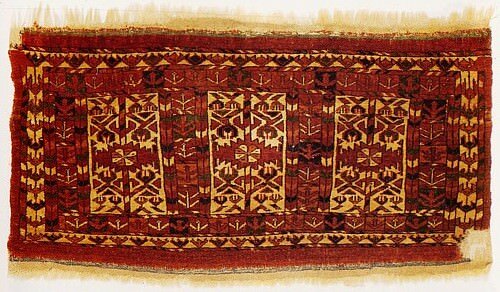 Tappeti dei nomadi dell'Asia centrale : della collezione del Museo russo di etnografia, San Pietroburgo / a cura di Elena Tsareva - Carpets of Central Asian nomads : from the collection of the Russian Museum of Ethnography, St. Petersburg / by Elena Tsareva. The 4,614 knots/dm2 fit with your Kpsi of around 300 but the knot is ‘asymmetrical right open left’, not asymmetric open right . And, of course, the attribution is Salors. Anyway, you asked for comparable pieces and this is the same field design. I have sent some images to Steve for posting; so they should be up fairly soon. Thanks Chuck - And I will look into the nano-Salon, hadn't seen it. Here are the images from Tsareva's catalog of the Kingston collection. There seem to be a general rectangular layout with the Aksu design across the tribes (Ak su, in two words seems to be the correct spelling, I am a lousy speller apparently also in Turkmen, sorry). I have seen Salor, Eagle group, Saryk, Tekke, Yomud and Ersari versions, though no Chodor. Ak su in Turkish translates as white (or fresh) water. Whether that has anything to do with the ak su motif is uncertain, though. Aksu is also the name of an oasis city in China on the silk road. 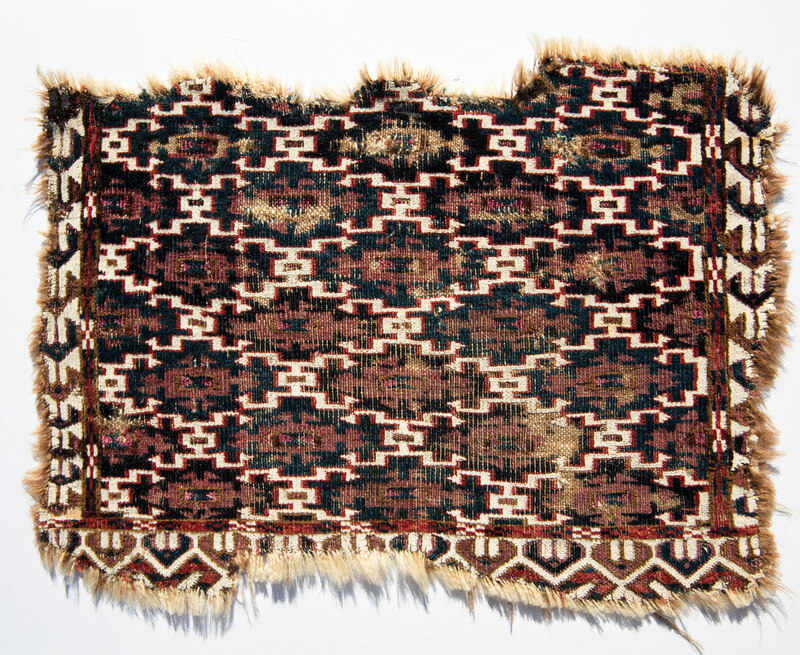 The motif may derive its name from some association with Aksu. I guess you can spell it as one word or as two words depending on your guess about its origin.